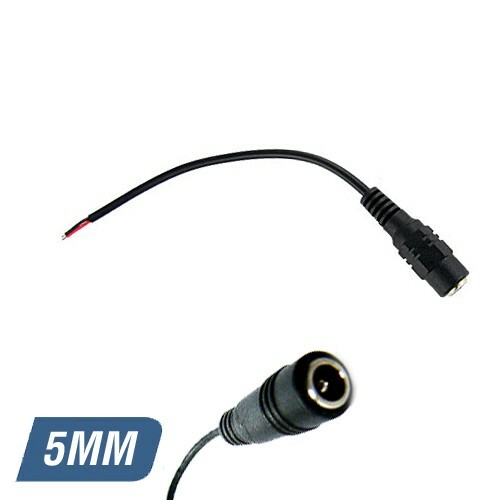 This is a 5mm (female) pigtail connector which connects to the 2.5mm pigtail (male) connector on the end of any of our ACDC Power Adapters. A single 5mm female jack pigtail connector can only be connected to a Single Colour LED Strip Light through soldering the loose wiring to the light (as indicated on the light itself) as such that the red is soldered to the positive terminal and black is soldered to the negative. Tip: We recommend that you use some glue and some heat shrink to cover the soldered piece of the cable to maintain IP Rating and for visual satisfaction. NOTE: Please consult a qualified electrician if you are unsure on how to do any of this.